For boys, in particular, there's so much fun and creativity to be found in a fully illustrated junior fiction book. Yes, the text may be nominal but sometimes the gist of the text, the humour and relatability are more than enough to feed the literary well of kids. War and Peace can come later - or - more righly - when they are ready. I mean, if they're struggling to read or just want something light, why scare them away with the onus of heavy nightly texts? My own eight-year-old son enjoys a good solid read but he also adored these Tom Gates books for their rollicking fun and humour - a bit like a footloose cartoon after a mind-pumping documentary. Tom Gates is an irreverent yet 'normal' school kid who takes much delight in torturing his older sister Delia. He's also a master homework escapologist and likes to spend his time doodling in his homework book and planning his next rehearsal with his band the Dog Zombies. In diary format, complete with kooky illustrations, the books feature fabulous kidspeak dialogue, adorable line drawings, wonderful typesetting and a rollicking pace of unfortunate events that bring out loud giggles. 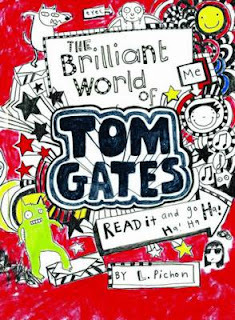 The Brilliant World of Tom Gates was shortlisted for Roald Dahl Funny Prize: The Funniest Book for Children Aged Seven to Fourteen 2011. My son has just started reading these too. He has only reached the stage where he can read to himself at night and so light hearted books like these are perfect. Any other suggestions in a similar vein? Aren't they fun books? My son also loves them. Check out the new Eric Vale series by Michael Gerard Bauer, and also see our posts on books that may attract http://www.kids-bookreview.com/search/label/Reluctant%20Readers - these are not only for reluctant readers, but for early readers and kids looking for something a little 'lighter'. Enjoy! They are so Brilliant, Great, and Funny! Are these books suitable for a twelve year old girl? Not to childish ? I think your twelve year old would enjoy the spontaneity and fun of these books although if she is accustomed to stories heavy on text, she may find these a little lacking as they emphasis light-heartedness through illustration - cartoonsque style. Just wondering if it is important to read them in order? Hi Michele, Tom Gates' books can be read independently.